One of the biggest things I miss with my new eating lifestyle is CEREAL. Good old fashion shredded mini wheat or Rice Chex. Corn Flakes, Fruity Pebbles, Lucky Charms. OMG I miss Cereal. In the never ending search I have come across a few good replacements. This one so far is my favorite. 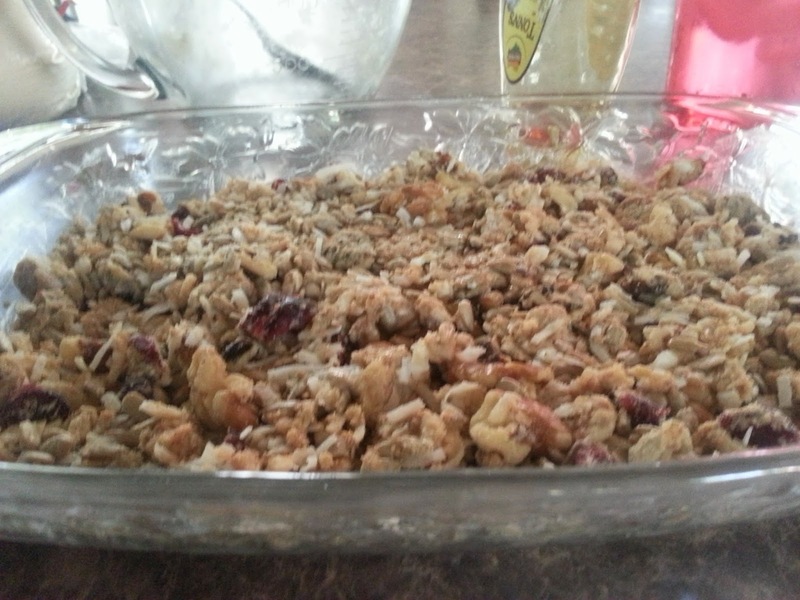 It serves the crunchy mushy consistency of most good cereals. It was good in a bowl of almond milk or just munching it by itself. My co-worker had some in her yogurt. This will become a staple in the clean eating/paleo kitchen. Mix all ingredients until well blended and coated. Then add to glass baking dish greased with coconut oil. Bake about 30 min until dark and baked through. let Cool a good 30 minutes then break apart. I used cranberries. I bet any dried fruit would be good. Or mix it up with a couple different ones mixed in. I didn't have coconut flakes just shredded. I would defiantly use flakes next time. The hardest part I find with keeping a healthy eating lifestyle is having food ready to eat. In our busy life's and hectic schedules making food seems to always be a challenge. We need the "grab & go" type foods in order to keep pace with life. 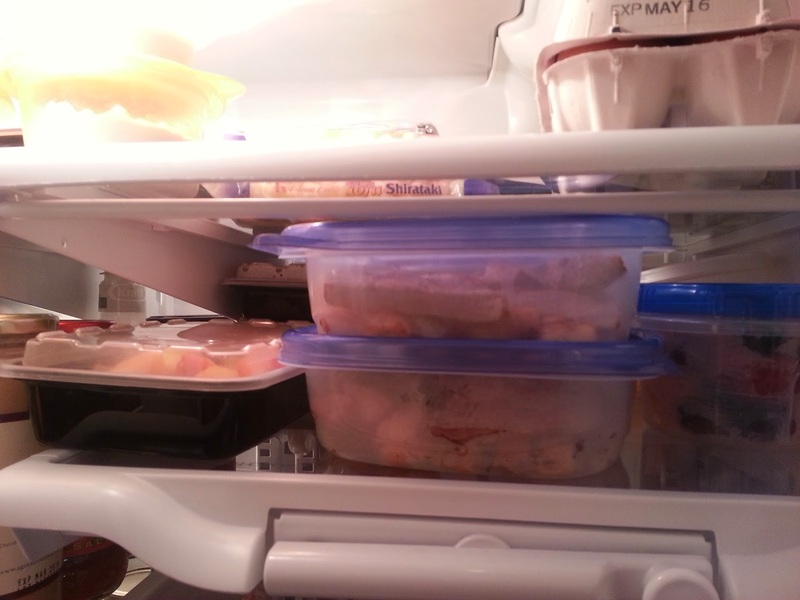 So without food prep days during the week, it's almost impossible to eat clean. Yes you could do it, but the enjoyment of the food you eat may not be so great. And if you don't enjoy eating it, you won't. The next thing you'll go far is that pre-made processed frozen meal, or a quick drive through meal. As much as possible I try to dedicate Sundays to meal prep. I make as many things as I can ahead of time so it's easier through out the week to just grill up a steak, or cook up a chicken breast to go with a side dish already made. It also helps for taking food to work everyday. 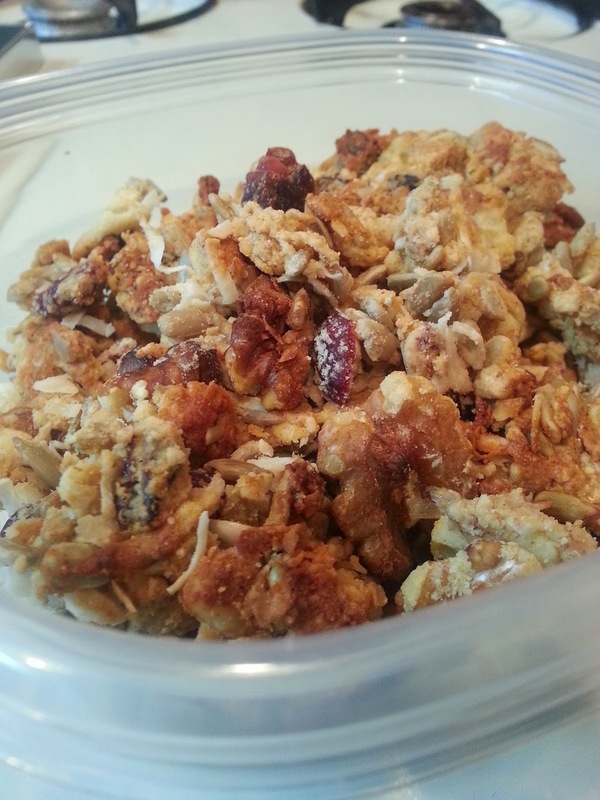 No prep time in the morning, just "grab & go" and you have your meals for the day. The trick to successful meal prep is knowing what you can make ahead of time and what you can't. Some veggies require you to eat them right away, like Asparagus. Its not very good re-heated. I also found chicken to be not so good re-heated. I don't know why but to me the flavor isn't the same. So instead of cooking the chicken, I just get it seasoned and packaged up in serving sizes ready to cook. 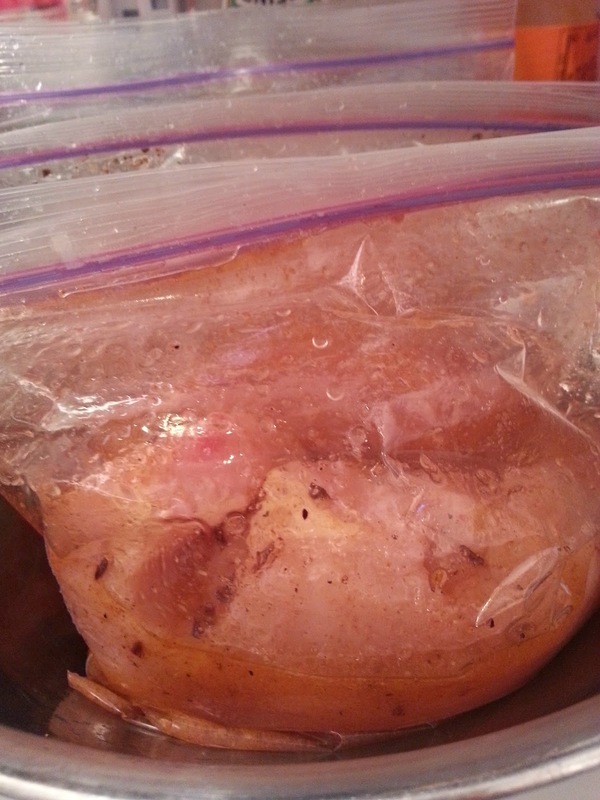 It's easy to then fry up, bake, or cook in the microwave and is loaded in flavor from marinating. Also super moist. 1. Decide what you want to eat during the week. Make a list that shows each day and what you're going to eat. It may change during the week but at least you have a plan. 2. Make a list and go shopping. Buy only what you need to make the items on your meal list. This will keep you from buying too much and then wasting it because fresh clean foods do not have long shelf life. 3. Come home from shopping and clean everything. You don't want to spend time during the week washing vegetables. You just want to cook them. So prep day is for washing everything. 5. Decide what can be cut up and stored for future use or consumption. 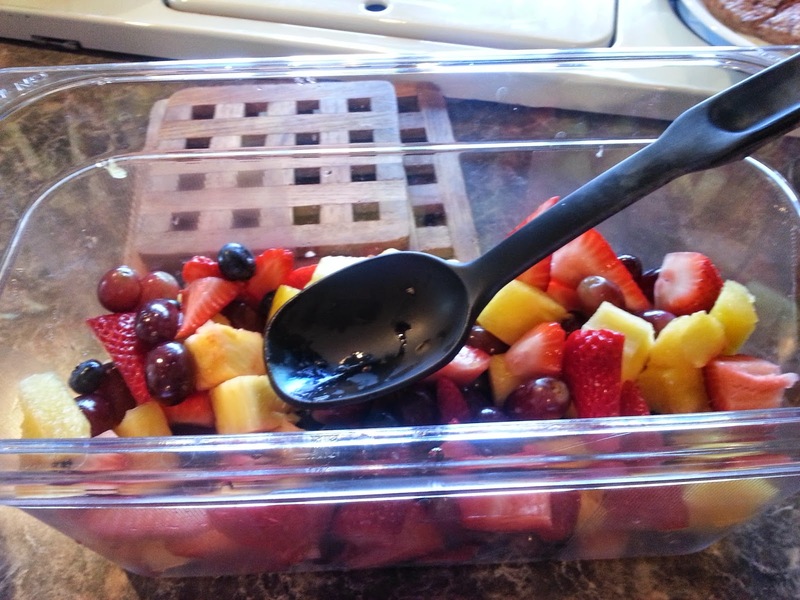 I usually make a fruit salad or at least cut up fruits so they are ready to eat. I also cut up veggies like carrots and celery for easy snack options. If I need them for cooking, hey they are already washed and pre-cut. 6. Make things like egg muffins, mini meatloafs, baked side dishes, and other meal items that can be pre-cooked. Hard Boil Eggs, pre-cook bacon and sausage. 7. Package up as much as you can into single serving size containers.